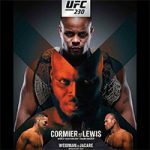 The Ultimate Fighting Championship returned to Madison Square Garden in New York City tonight for UFC 230: “Cormier vs Lewis.” The event featured a UFC Heavyweight Championship bout between Daniel “D.C.” Cormier and Derrick “The Black Beast” Lewis, who made a quick return to action. In tonight’s middleweight co-feature, former champion “All-American” Chris Weidman battled submission specialist Ronaldo “Jacaré” Souza. Also at 185 pounds, David Branch took on Jared “The Killa Gorilla” Cannonier. MMARising.com has live play-by-play for the UFC 230 main card. Lewis struck first with kicks and Cormier answered with one of his own. He shot in and took Lewis down against the base of the cage. From the top in side control, Cormier landed short punches and elbows until Lewis scrambled up to his feet. Cormier tripped him again and resumed striking from top position. Big shots landed for Cormier and Lewis rolled over. Cormier continued to punish him with right hands as Lewis tried to stand back up before the bell. 10-9 Cormier. Could be a 10-8. The second round began with Lewis landing a one-two and a jumping switch kick. Cormier caught a kick and dumped Lewis to the mat, but Lewis quickly rose to his feet. Cormier used an ankle pick to get him back down into side control. He took Lewis’s back in a scramble and locked on a rear-naked choke, forcing Lewis to hastily submit. Winner: Daniel Cormier by Submission (Rear-Naked Choke) at 2:14 of round two. He improves to 22-1-0, 1 NC and remains the UFC Heavyweight Champion. Weidman established his jab right away, but Souza landed a solid leg kick in return. Weidman secured a Thai clinch and landed a knee before Souza punched his way free with uppercuts. Weidman flurried with punches and stunned Souza with a right hand. Souza recovered and pressed forward with body shots. More punches landed for Weidman and Souza began to bleed from the nose. Souza scored with two left hooks to the liver and followed with an overhand right. 10-9 Weidman. Round two opened with Weidman landing more one-twos to the head and body. The fighters exchanged knees and uppercuts in a clinch and Souza landed some of his best strikes of the fight. He walked Weidman down with liver shots, but Weidman cracked him with a counter left hook. Souza briefly retreated, but he regained his footing and peppered Weidman with left hooks and uppercuts. Weidman eventually caught a head kick and tripped Souza, which allowed him to initiate a clinch against the fence after Souza rose to his feet. Weidman dragged Souza down, but Souza rolled forward and the bell sounded as the fighters stood back up. 10-9 Weidman. Weidman targeted the body with knees and punches in round three, but Souza backed him up with a lengthy flurry. Weidman landed an uppercut, a standing elbow and a right cross in succession, and he followed with jab-hook combos. Souza staggered Weidman with a five-punch flurry and he dropped Weidman like a rock with a right hand to the temple. Referee Dan Miragliotta did not halt the fight, even though Weidman was barely clinging to consciousness, and Souza was forced to land three more hammerfists before the bout was finally stopped. Winner: Ronaldo Souza by TKO (Punches) at 2:46 of round three. He improves to 26-6-0, 1 NC. Branch closed the distance right away and took Cannonier down, but Cannonier scrambled up and landed some nice knees to the body. Branch muscled him down again and he used punches to set up a rear-naked choke attempt. Cannonier escaped to his feet again and Branch circled while throwing leg kicks. He eventually got Cannonier down very briefly, but Cannonier stood and fired off a flurry of knees, punches and a spinning hook kick. Close round. 10-9 Branch. Cannonier dropped Branch with a right hook early in the second round and he dove on him with vicious elbows on the ground. A dazed Branch covered up and rolled to his side as Cannonier landed unanswered punches until the fight was waved off. Winner: Jared Cannonier by TKO (Elbows & Punches) at 0:29 of round two. He improves to 11-4-0. Roberson opened the fight with a hard body kick and followed with a straight left hand. He cracked Marshman with two left hooks and chopped away at his lead leg with kicks. Roberson hurt Marshman with a knee and swarmed on him with punches, but Marshman recovered quickly. More leg kicks landed for Roberson as the round progressed and he avoided Marshman’s counterpunches in the final minute. 10-9 Roberson. The second round began with Marshman throwing kicks, which were answered by a left cross from Roberson. Marshman fired off a seven-punch combo, but Roberson wobbled him with a counter left. Power punches were exchanged soon after and Roberson took Marshman down into half-guard. He moved to side control and peppered Marshman with punches until the end of the round. 10-9 Roberson. In spite of a damaged left leg, Roberson attacked with kicks early in round three and he followed with a big left hand. Another left hook landed for Roberson and Marshman began to bleed heavily from the mouth. Roberson took Marshman down into side control and landed elbows from the top. He used a keylock attempt to set up a pass to mount. Roberson closed out the fight with punches and elbows from top position. 10-9 Roberson, if not a 10-8. Winner: Karl Roberson by Unanimous Decision (30-26, 30-26, 30-27) after three rounds. He improves to 7-1-0. Brunson clinched right away and worked for a takedown, but time was called after he twice grabbed on to Adesanya’s shorts. Action resumed and Brunson continued to try to take the fight to the ground. He dove at Adesanya’s legs, but could not get him down. Both men landed straight right hands and Brunson lunged in with lefts. He pinned Adesanya against the fence, but Adesanya circled away and hurt him with a knee. He dropped Brunson with another knee and two right hands, but Brunson regained his footing. Adesanya dropped him again with a head kick and kept the pressure on with punches and knees as Brunson wilted against the cage, forcing referee Herb Dean to stop the fight. Winner: Israel Adesanya by TKO (Knees & Punches) at 4:51 of round one. He improves to 15-0-0.